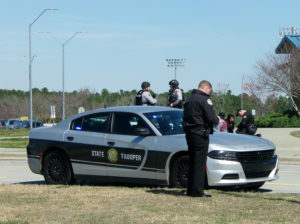 Several dozen law enforcement officers converged on the campus of West Johnston High School on Raleigh Road near Benson around 11:00am this morning (Friday) following an incident. 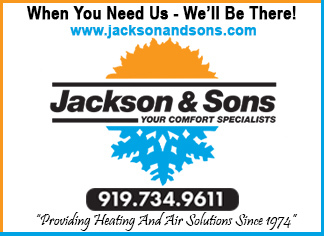 WTSB News has learned that 7 teenagers went to the school in an apparent attempt to see a West Johnston student. 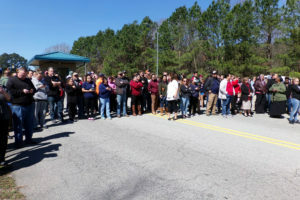 The seven people – 5 male and 2 females – believed to be from Wake County were denied access to the student by staff members in the school office. 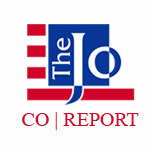 After being denied access some type of verbal altercation ensued and staff members and a school resource officer were able to detain 4 of the 7 individuals. Three others fled on foot outside the school. The school was immediately placed on lockdown and anxious students began texting and placing cell phone calls to their parents. Over 100 parents arrived at the main entrance to the school within minutes concerned about the safety of their children and seeking more information. 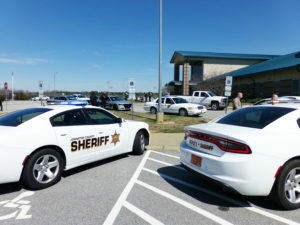 Around 11:45am, Johnston County Sheriff Steve Bizzell addressed the parents at the main entrance informing them of the situation. Sheriff Bizzell said no weapons were involved and there was no reason to believe the 7 individuals were at the school to cause any harm. 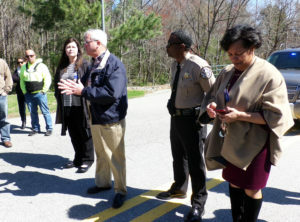 Sheriff Steve Bizzell (wearing a blue jacket) addresses concerned parents at the entrance to West Johnston High School. Sheriff Bizzell said the 7 teens never made it down the hallway of the school and were immediately stopped by staff and the resource officer. 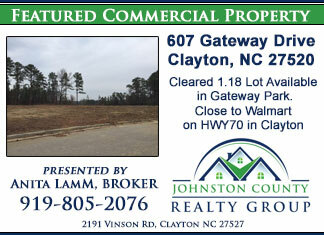 Around 12:00 Noon, the remaining 3 individuals were located and taken into custody. Concerned West Johnston High parents gather at the front entrance near the school awaiting news. No injuries were reported and no students were involved. 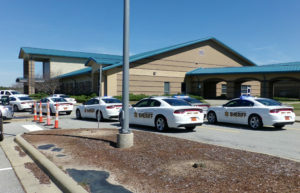 The lock down was lifted around 1:00pm and parents were allowed to pick up their children early and students who had driven to school were allowed to go home. 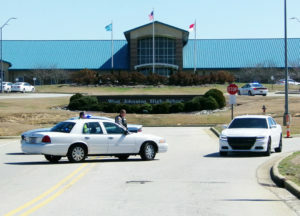 Johnston County deputies and NC state troopers at West Johnston High School. Sheriff Bizzell said NC Governor Roy Cooper called him immediately after the incident was reported and offered any type of state resources should they been needed.